These smell amazing when they bake. 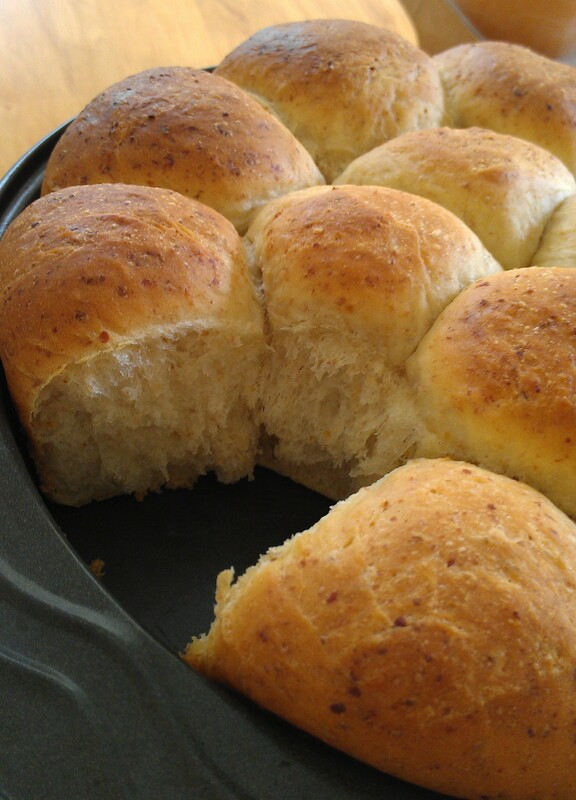 Adapted from my favorite honey-wheatgerm roll recipe….these rolls are the sweetest and softest I’ve ever tasted. The addition of wheat germ adds the whole wheat flavor back in, while keeping the smooth taste of the white flour. Rolls can’t get any better than this. They have become my new favorite Thanksgiving contribution. Place dough balls close together, let them rise to the point that they all stick together and fill the pan. Aw, it looks so lonely. I’ll eat you, little roll! Right after this photo. Dissolve yeast into 1/4 cup warm water. Let stand 10 minutes. It should bubble and foam. Mix flour, wheat germ and salt in bowl. Combine well. Stir softened “butter” and agave into 3/4 cup warm water until both are well dissolved. Pour yeast mixture and “butter” mixture into flour mixture. Start combining dough until it forms a ball. Dough ball should be smooth, not sticky. If it is sticky, add 1/3 cup flour by small increments until stickiness is gone. Knead dough by hand until it is smooth and elastic, about 5 minutes. Place dough in oiled bowl, and cover. Let rise 1 hour, or until doubled. 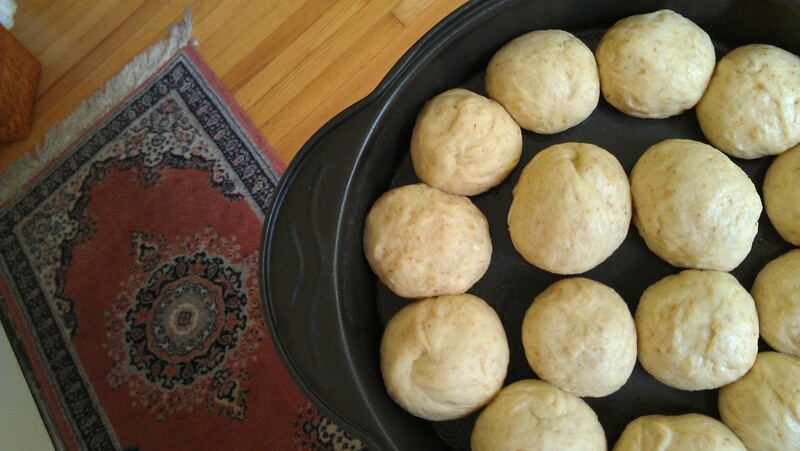 Cover dough; let rise 45 minutes, or until balls have doubled in size and are filling out the pan, sticking together. Preheat oven to 375. 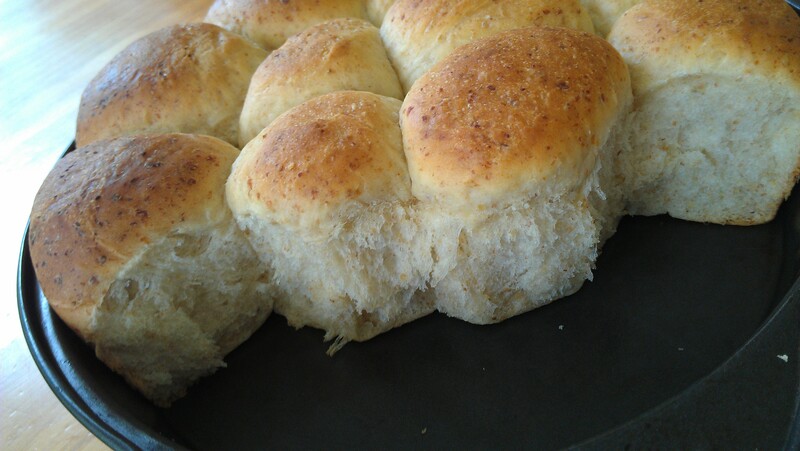 Brush tops with melted “butter”, bake 20 minutes, or until tops of rolls are browned. I turn my oven heat off halfway through cooking to make sure they aren’t overdone and to save energy. Oh my gosh, these look so flaky, buttery, fantastical. Love the addition of agave. Thanks, Danny….they are soooooo good. I’ve never made anything so picture-perfect as these rolls. I am definitely going to have to make these. They look so good! Hope you enjoy! Let me know how it works out. It’s been a long time since I made rolls in a round pan! I forgot how beautiful it looks! Yours look mouthwateringly delicious to boot! Thanks dahling! They are super delicious….can’t get enough of them. Back to school for the kids, time to get back into baking! I think rolls will make cuter sandwiches than plain ol’ sandwich bread. I’m breaking out the round pan! I kind of want to make out with them… is that weird? Do you think this would work with oat/spelt flour? These look delicious!! I must make these soon! Yeah…they are ridiculously good. Happy baking! Well, I’ve finally found a use for the wheat germ that’s been taking up valuable space in my cabinets! I understand. A few posts ago I was just talking about how I normally fail at yeast breads. My mistakes were: not letting the yeast dissolve enough, using water that was too hot, not letting the bread rise long enough. Once I ironed those things out, I went from bread loser to bread winner! And you can too! Waw! Your vegan rolls look so delectable & tasty too! Do you think that white whole wheat flour would work as I do not cook at all with white flour only whole grains. I’m making these right now for a friend who has been in the hospital. I thought, soup and rolls, and remembered these! You are so thoughtful. I hope your friend gets better soon and that your baking mojo is flowing. I discovered a big baking mistake recently: NEVER use refrigerated flour. I can’t even talk about how horrible the result was! 😉 Hope your friend enjoys. 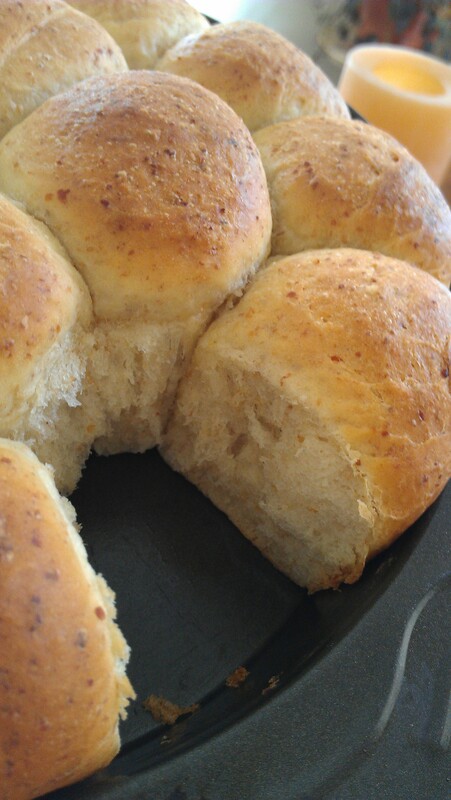 Girl…those rolls look soooo buttery and good! These look just perfect! I’m SO making these! Discovered your blog from Somer. I noticed your comment about not using refrigerated flour…why is that you think? Did they not rise? I store all my flour in the fridge so it stays fresh longer (as suggested) on the bags. Thanks! Hi! Thanks for visiting! So glad you’ll be making these too. This is one of my favorite recipes because it wows everyone and the result is SO delicious. Brush with extra earth balance for an extreme buttery experience! 😉 The reason you need to use fully-room temperature flour is because when you combine the warm liquid with the cold flour you will end up with a mixture full of nasty, rock-hard flour nuggets. I ruined a few batches before I figured out what it was. There’s something about the combo of warm liquid, cold flour and yeast that causes a weird reaction. And the rolls will not rise, I guarantee it. Even if you pick out all the hard flour rocks the dough will be so dense you won’t be able to knead it or get it to rise. Nightmare! No problem – and prepare to wow everyone at thanksgiving! Oh wonderful! These look delicious, and gorgeous presentation! Must try! on November 22, 2012 at 6:59 pm | Reply Happy Thanksgiving- Get your vegan gobble on! « Goodstorysarah. we made these rolls today! my son and husband can’t get enough. they are delicious and apparently fun too! i subbed sunflower oil for the Earth Balance and it was fine. just fyi! Hooray! Makes me happy to hear! 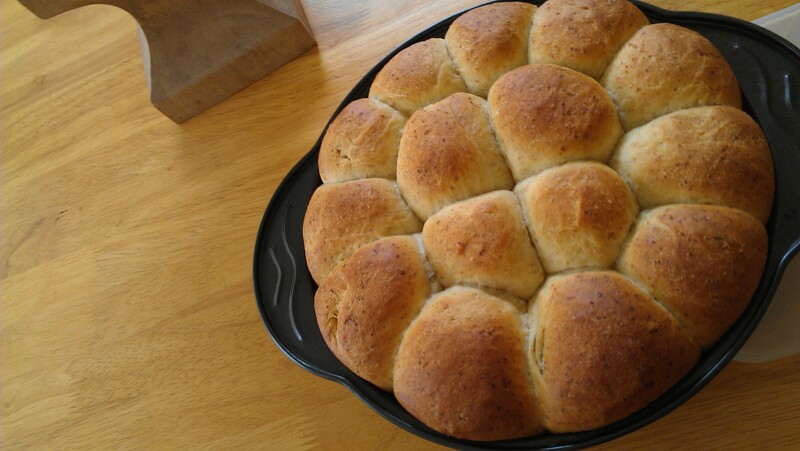 Those rolls are amazingly delicious and I want to eat them every day. Glad your baking mojo is flowing! Would this work if you used whole wheat flour, do you think? Also, would maple syrup or brown rice syrup work to use instead of agave? Hi! My opinion is that the whole wheat flour would be too heavy- not fluffy enough for proper chewiness, and definitely not the right flavor. The white flour plus wheat germ has a very special flavor that I’m not sure can be achieved with the darker, grainier whole wheat. As far as the sweetener goes, any syrupy sweetener should work. The original recipe calls for honey, so anything similar to honey should be fine. Of course, you can safely ignore me and do whatever you like, because I am definitely not an expert on baking!! on December 22, 2013 at 3:14 am | Reply Ideas for a “Raw-er” Christmas | Going Raw with Kids! hello (again!) 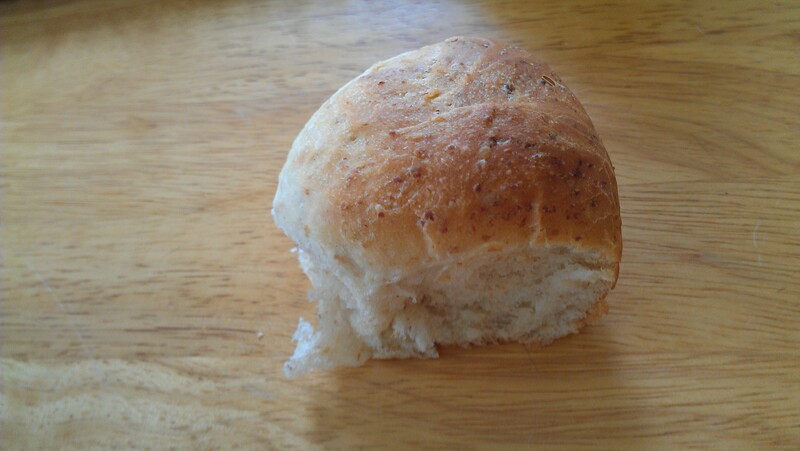 i used these rolls as the basis for my hot cross buns. um, yum! hope you are well! These look so yummy! However, I need them to be gluten free as well as vegan. Any suggestions for flour and wheat germ substitutes. Thanks for great recipes. I am sorry, but gluten-free baking is not my forte. There’s lots of substitutes for wheat flour out there, but wheat germ is a tough one to fake. You might search the sites of GF experts on wordpress, I’m sure there’s a solution! Good luck! looks delicious. can they be frozen before baking. I’ve never done that, but I imagine you can treat them the same way you treat non-vegan rolls…. Yes! I’m sure that will be fine!